Chapel Lawn - Whither or wither - a chance to decide? A small group has been set up in Clun to investigate whether a project to produce a new community plan has support and to recommend to the Town Council whether that plan should be a Neighbourhood Plan or a Community Led Plan. At present I am a member of that group. I would welcome comments and questions from residents and businesses in Chapel Lawn ward. The focus appears to be very much centred on the town of Clun as most of the group are from Clun. If the project progresses with financial help from Shropshire Council then it is important that voices from more rural, remoter areas are heard. If you contact me you are not committing yourself to any involvement though, of course, if you are interested in getting involved that would be very welcome. My contact details are at the end of this article. Please do read on………..
You may remember the Clun and Chapel Lawn Parish Plan which was produced around 2009/10. It is nearly 20 years since Parish Plans were first thought of as a means of giving a voice to those living in rural areas. Some plans failed but some were extremely successful. Today rural communities have two options if they want to have some control over what happens in their area. There are Neighbourhood Plans and Community Led Plans. Neighbourhood Plans are specifically about planning as in development and land use. They are very technical, requiring on going advice from a planning expert and needing to be assessed at the end by a Planning Inspector. If the plan is found to meet the criteria it becomes a legal document which planners must take into account when considering planning matters in that parish. Community Led Plans are very similar to the previous Parish Plans. They are led, as the name suggests, by the community not the parish council and cover those matters that the community feels are important. That can include transport, housing, environment, planning, community facilities, community governance, communication and more. The important thing is that these broad subjects are broken down into practical issues that we in the community can do something about. The focus is on coming up with a plan to retain what we want to retain and preserve, to change those things that we want to change and to ensure that the production of the plan itself is only the beginning. What matters is that the aspirations of the community are realised through follow up and action. Action, that is, by the community, using local government and other statutory bodies and any individual, group or organisation willing to help us reach our goals. A shorter version of this article appeared in The Redlake this month. If you are at all interested in what goes on in your community - do contact Carolyn. Our short 4 page magazine/news letter ‘The Redlake’, is kept deliberately short and readable, but this means that sometimes articles which people have written have had to be edited. Some of these articles can be read in full here, sometimes with additional pictures. It is sometime since the Redlake News covered the work of the wonderful postal workers who serve us so well in this hilly terrain. With a host of narrow lanes, muddy badly maintained tracks, drivers who can't or won't reverse, stray animals, loose dogs and vicious letterboxes it's not a job for the feint hearted. One can also add in long walks to front doors and the weather we have. The Redlake Valley is part of the Hopton Castle round and there are two main people who deliver our mail, Colin Morris and Trudy Gough both of whom are locals born and bred. Colin has always lived in Craven Arms and Trudy was bought up close to Ferney Hall at Onibury. Sometimes during holiday periods our post is delivered by Kevin Lane and occasionally by Liz Stokes. Colin has kindly agreed to help with this profile in his own time and I asked him the following questions. Besides taking out parcels and post what other duties does a postman/woman do during a shift? Collecting mail from post offices and post boxes. Sorting out mail in the sorting office, especially the business mail after a collection. Most postal staff work a 0700 to 14.30 shift, however the work for Colin is normally a shift starting at 10.30am and ending at 6.30 pm. The day starts with collecting ready sorted mail which are categorised into boxes, these are taken out into the post van which has fittings for them. The deliveries have to finish by 4pm in order to do the collections. There are restrictions in the timings for the collections, for instance mail from Clun post office cannot be collected before 4.30p.m. and Bishops Castle cannot be collected before 5.15p.m. How many different rounds are there in your repertoire? Colin has knowledge of eight rounds, Acton, Bucknell, Clun, Hopton Castle, Wetmore, Craven Arms Town, Cheney Longville and Middlehope. Each round has a book called a walk log which lists all places to deliver to and has a map in it, the posties can write up in this any hazards at the various drops(delivery locations) and special delivery information and changes to the round. Have you had any difficult experiences in bad weather such as this last winter? A decision is made to stop deliveries when conditions are really bad by the manager at Craven Arms. Quite often rather than cancelling the whole round the staff will do what they can such as covering low lying areas, if the snow and ice is just in the hills. Snow, ice and fog can be very localised so it isn't an exact science judging what can and can't be delivered. If a round is cancelled the postie then assists a colleague on another round that is able to get out. They help their colleague to deliver the parcels and try to save time when bad weather means longer walking times to properties and other complications. Most unusual thing found in a postbox during a collection? Finding sweets and cartons of squash is quite common, presumably placed there by children for the postie to have during a break. How big is the round? There are about 300 places (called drops) to deliver mail to on the Hopton Castle round. Something the public may not appreciate is that around here Parcel Force lorries can't always get to some locations and so undeliverable parcels are given to the posties to deliver. Anything customers could do to help you? 1. Overgrown paths can be very hazardous with tripping hazards. Overhanging branches are a nuisance especially when wet as brushing against them means the postie gets soaked. 2. When you have a new door please remember to include a new postbox in your plans and have a word with the postie, warning them beforehand of the change over and where you would like mail left. If there is going to be a period without a postbox the postie can't guess what your wishes are! You must have to deal with animals. Any stories to tell? Marianne Bright who used to do our round opened up the back of the van to find a dog in it. It had jumped into van during one of the calls, she had actually driven some distance since the last call so had to go back to make a second delivery to the address, this time to return the dog! Colin was going upto Hobarris one day and there was a cow in the road, it wouldn't move over to the side of the road and slowly walked up the lane, stopping to graze every so often. Colin did his various deliveries but each time he rejoined the lane the cow was still there a little further along, he eventually managed to get past it at Pen-y-Wen crossroads. 11. What happens if you have a van break down on a delivery? The Royal Mail has an arrangement with one of the national motoring organisations to aid a swift recovery if one of the vans breaks down. The system is that the drivers are responsible for checking over their vehicles on a daily basis looking for any obvious defects before they commence their shift. If a van is out of use for repairs then a hire van may be used. I noticed that Colin's van although it just travels locally in areas around Craven Arms had travelled over 105,000 miles. It is only 5years old! On the round that includes the Redlake Valley Colin has only got stuck once, up at Cwm Farm above Clunton where the farmer came to his help with a 4w drive vehicle. Elsewhere local farmers have helped in bad conditions with tractors. 13. Any stories about badly packed items. Badly packed items are thankfully a rarity. When a package or parcel has burst open the item is taken to the manager at the sorting office who verifies the problem and the item is placed in a strong plastic bag so that no items within the parcel can go astray. Paperwork outlining the problem is completed and the manager signs this. The item can then be placed for delivery on the next round. 14. Anything else you think the community may not appreciate. 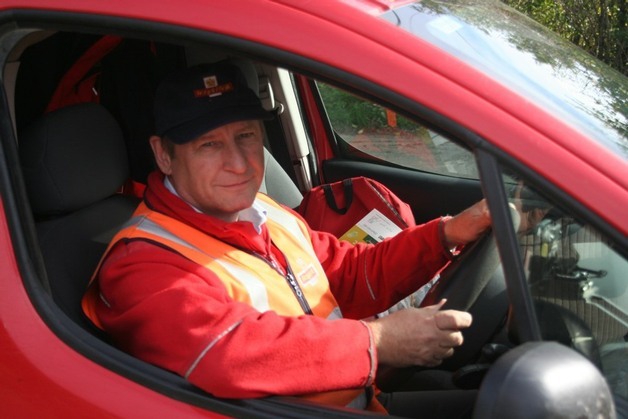 Colin has been doing postal work for 12 years and enjoys his job, he says," always say Hello", to the postie, they like to be part of the community. 15. Has the nature of the job changed in recent years? With the advent and huge growth in internet use, letters have declined, people communicate more often with another now by using email, social media and texting. Colin has also noticed a decline in the number of cards, even at Christmas. How many of us send postcards from our holidays these days? Colin and I agreed that although there are other ways to communicate, receiving a letter is always rather special and that it's nice to receive a proper card. Colin says his motto would be "send a card and a smile". Whilst the internet has reduced personal use of the postal service it has generated a huge increase in the number of parcels and packages, this is down to the growth of internet shopping. To aid the different service standards for delivering parcels scanners are used. These include tracked items no signature required, signed for items, and special deliveries deliver by 1pm. These latter items occur every day and require the postie to interrupt their round to go to the delivery location. 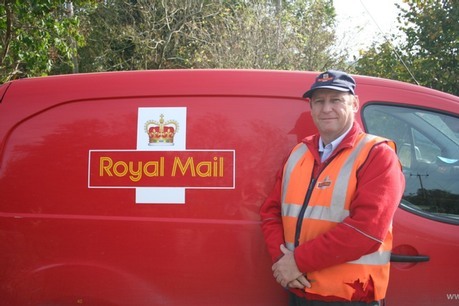 If the item isn't delivered by 1pm the customer can make a claim against the Royal Mail for late delivery. Finally I would like to thank Colin Morris for giving up his own time to be interviewed for this article. I would like to point out that no mail was delayed by the compilation of this article!